Landscape Use: Ground covers, accent, border, indoor pot plant in bright indirect light, entry plants, hanging basket. Use of this plant will dictate selection of the appropriate cultivar. Form & Character: Evergreen herbaceous perennials, stiffly upright to arching and spreading depending on cultivar. 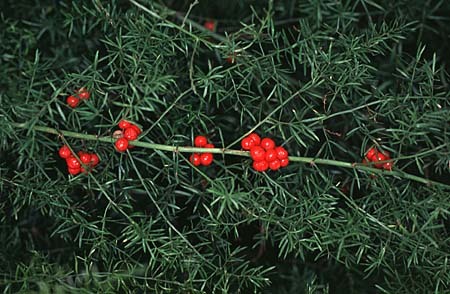 Growth Habit: Moderate, clumping to 2 feet tall with equal to greater spread. Foliage/texture: Leafless, instead of leaves asparagus fern has bunched cladodes (stems as a modified leaf) that are functional equivalents. The stems themselves are green and armed with small spines of variable length and density. 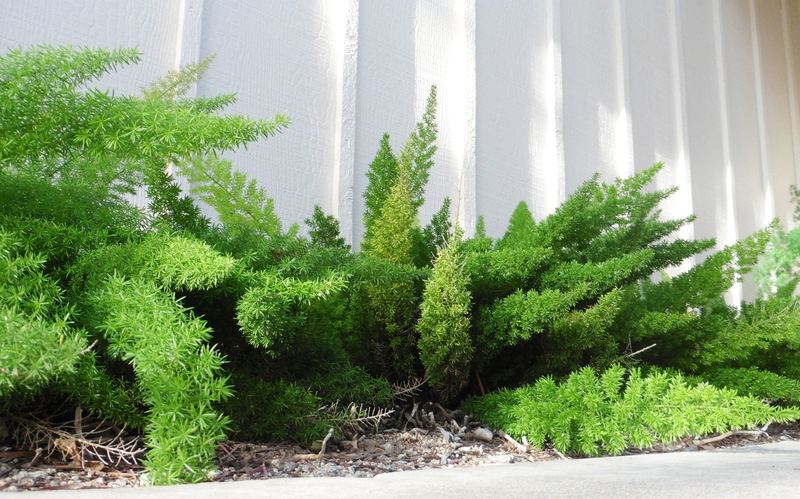 Asparagus fern also produces copious numbers of water storing tuberous roots immediately at or just below the ground surface. Overall, this fine smallish landscape shrub has a medium fine texture in the landscape. Seasonal color: White flowers in spring, red berries in summer to winter. Light: Partial shade best, avoid western sun in Phoenix. Soil: Well drained, sandy to loamy soil best, relatively high nitrogen requirement. Fertilizer in late winter and mid summer. Watering: Needs regular supplemental water from April to October. 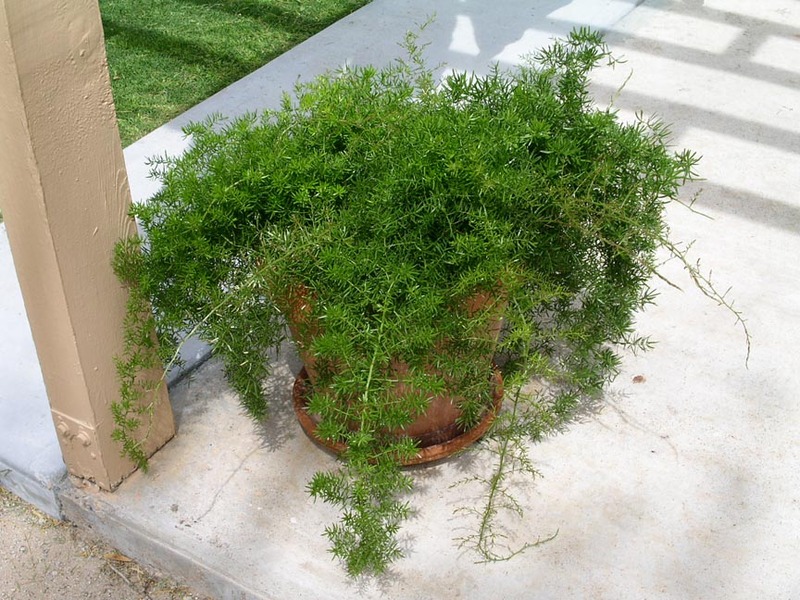 Water storing tubers help asparagus fern tolerate some dryness. Pruning: Remove dead stems. Periodically (every 3 years) prune hard to ground to rejuvenate plant appearance. Disease and pests: Root rot if soil poorly drained. Be careful to not allow intrusion of Bermuda grass. 'Cwebe' - an upright version of 'Sprengeri' with graceful, arching stems, copper colored when young. Avoid sun exposure. 'Sprengeri'- broadly arching and prostrate. not for small spaces, morning sun. 'Sprengeri Compacta' - semi dwarf form of 'Sprengeri' that is more desirable for smaller spaces, morning sun. 'Meyers' - upright and rigid makes, an excellent accent plant in terms of a contrast in form with other landscape plants. Asparagus retrofractus (pom pom asaparagus) is also an upright ornamental plant.